January 19, 2019 By Leroy Thompson & filed under All Articles, Long Guns, Tactics/Training. 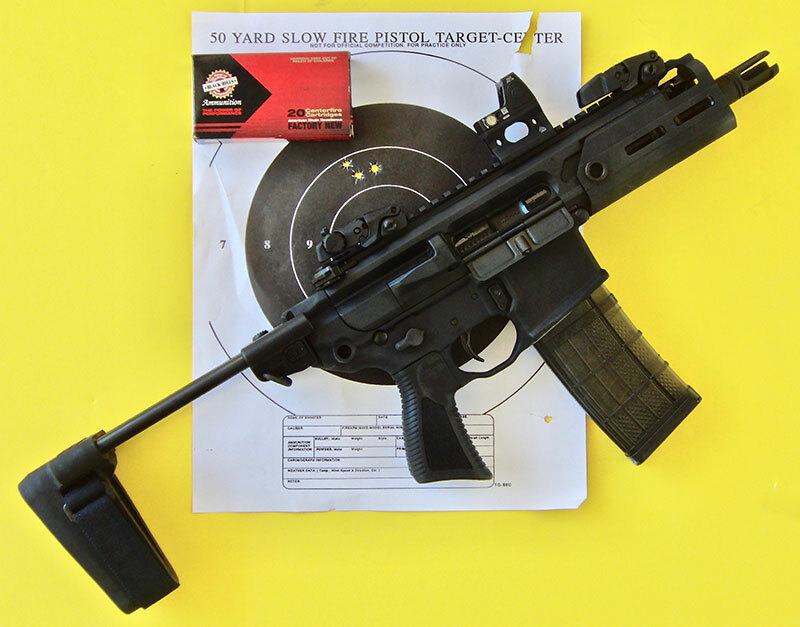 SIG Sauer Rattler is as compact as an SMG but more powerful at longer ranges, and it is not an NFA weapon. I’m fortunate to live in a state where citizens can carry a loaded handgun, rifle, or shotgun in their vehicle. By far the most commonly carried weapon is a handgun. This often means an everyday carry handgun, but many people, including me, carry a larger, more powerful handgun in their vehicle when they carry a concealed pocket handgun to walk around. I’ve always liked to have a combat shotgun available but have found I don’t like the 18-inch shotgun with a pistol grip for my vehicle even though it is easier to access and bring into action. A short-barreled shotgun with 14-inch barrel is much handier in a vehicle. Rather than use a registered SBS, I’ve started using Mossberg’s 14-inch Shockwave in 20 gauge. It handles quickly and may be easily accessed within the cab of my pickup truck. BATFE rulings allowing the use of the Shockwave were a real boon to shooters. I’ve also carried a rifle in my truck at various times. Sometimes it’s been a Scout rifle and others an M4 Carbine. Once in a great while, I’ve carried a .308 AR-type rifle or an AK-47. I’ve been aware of the .223/5.56x45mm pistols with arm braces that are currently legal, but only started using them within the last six months. 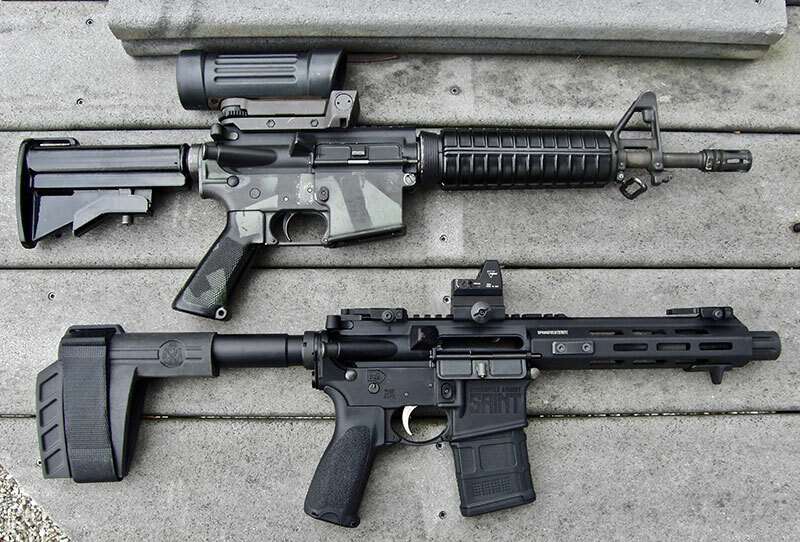 These pistols offer the advantages of an SBR such as a Colt Commando without requiring registration. They are handy, give the user a lot more firepower than a pistol-caliber weapon, and may be shot more accurately at longer ranges, especially with an optical sight mounted. 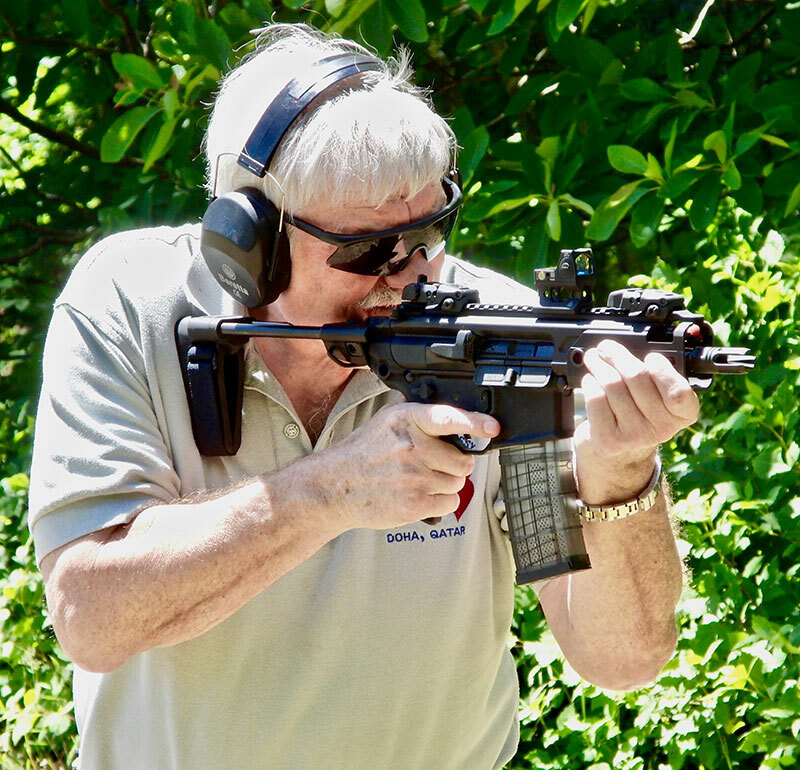 Thompson trains with Springfield Armory SAINT for deployment from within a vehicle. Blast diverter is useful in keeping blast away from the shooter. With the short barrel, blast would be especially noticeable within a vehicle. I decided a 5.56x45mm pistol would be the best choice for my purposes, though I can see why some might choose one in .300 Blackout. Other pistols are available that will perform the mission, but I chose the Springfield Armory SAINT with arm brace. I have also been testing the SIG Sauer Rattler. I like both of these pistols a lot, but for normal vehicle carry, the SAINT suits me the best because it is in the widely available 5.56x45mm caliber and takes AR-15 magazines. On the other hand, the Rattler is readily fitted with a suppressor, takes a .30-caliber bullet, and comes with a collapsible arm brace that keeps overall length to 16 inches with stock collapsed. The Rattler will also take AR-15 magazines. I like both of these rifle-caliber pistols. One consideration is that the MSRP of the Rattler is about three times that of the SAINT. Ammo in 5.56x45mm is also available in bulk, less expensively than .300 Blackout. SAINT is virtually as compact as a Colt Commando but without NFA requirements. With the standard arm brace, the SAINT is 26.5 inches overall, quite a bit longer than the Rattler. A folding arm brace could be installed but that would add expense. Part of the greater length is that the SAINT has a 7.5-inch barrel, while the Rattler has a 5.5-inch barrel. That enhances the effectiveness of the SAINT at 100 yards. 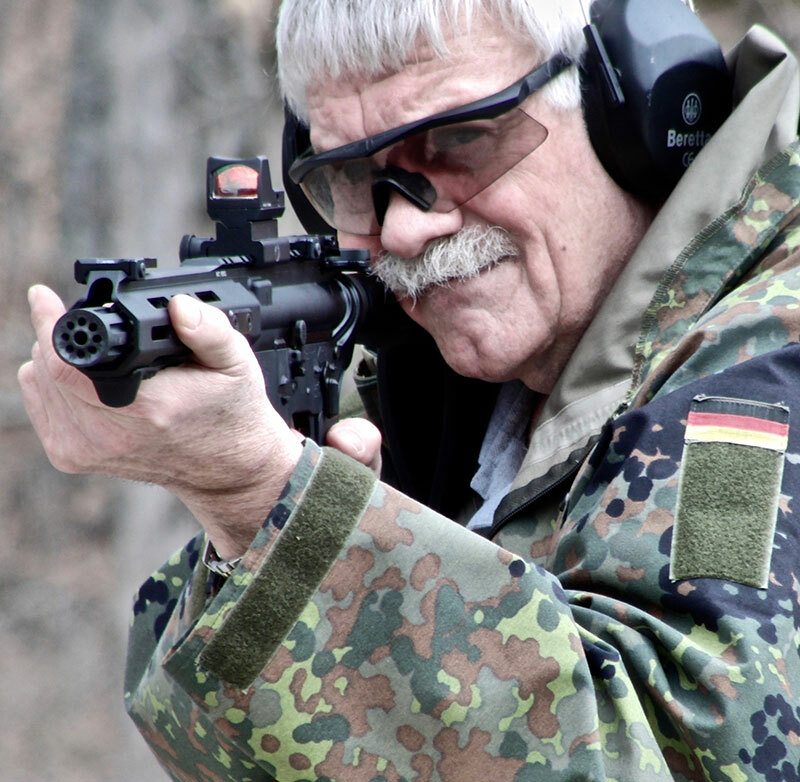 To optimize the rifle-caliber pistol with arm brace, I recommend the use of an optical sight, in my case a Trijicon RMR red dot. Additionally, I installed low-profile Bobro Engineering flip-up BUIS. I’ve also been shooting an RMR on the Rattler. For deployment within a vehicle, I prefer a 20-round magazine, though I carry 30-round magazines as spares. I live in a tough urban area, so a rifle-caliber pistol carried in my vehicle is valuable for its stopping power, penetration, enhanced accuracy, and intermediate range. Mostly, I view it as an insurance policy. Should I need its enhanced features, it is available in my vehicle. It offers greater preparedness for all types of situations. I’ve specifically carried out variations of debus-under-fire drills I used to practice when I worked on protective teams using my SAINT or the Rattler. SIG Sauer Rattler offers a lot of weapon in a compact package with its collapsible arm brace and .300 Blackout chambering. 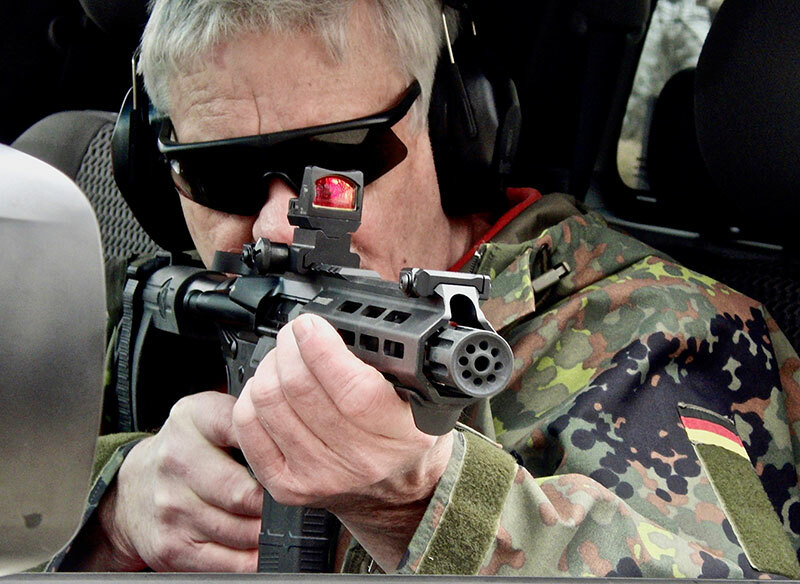 With the Trijicon RMR optical sight, it is very accurate at CQC ranges to 50 yards and usable against man-sized targets at 100 yards or greater. In the day, those drills were normally carried out using an SMG or a carbine. It’s semantics now I’m using a “pistol with an arm brace,” but it works just as well. I’ve tried engaging targets from within the vehicle, safely exiting the vehicle and bringing the weapon into action, and moving to cover to engage at ranges from 15 to 50 yards. I have also practiced with the arm brace pistol to 100 yards so I’ll feel confident at that range. Both pistols have proven accurate and fast handling. I am confident either can enhance my capability to defend my family or myself when in my vehicle or in an emergency if the vehicle gets stopped. Other considerations arise if you choose to carry an arm brace, rifle-caliber pistol in your vehicle. Perception is one. If you live in an area not especially firearms friendly, these weapons may not be legal. If they are legal and you use them to defend yourself, you have used an “assault-weapon pistol” or some other hoplophobe catch phrase. Rather than your “self-defense pistol,” you’ve used an evil, aggressive weapon. SAINT’s forward hand stop keeps support hand from slipping in front of the muzzle. But the left, which dislikes the police, are always looking for a cause. The “assault pistol” may give them one. In St. Louis, where I live, a STLPD officer who was involved in a justified shooting with his issue Beretta was tried for murder. One of the major prosecution and liberal press arguments was that he had initially approached the suspect vehicle with his personally owned and non-department-authorized AK pistol—an assault weapon indicating his aggressive intent. He did not use the AK pistol, but its presence was made an issue. Another consideration in keeping a vehicle weapon is that it is secured in a gun vault large enough to stow it. Rifle-caliber pistols with arm braces fit in a smaller gun vault, which is of course an advantage. In carrying a rifle-caliber weapon as a vehicle gun, especially in urban areas, ammo choice is important. For a 5.56x45mm pistol, frangible ammunition would make sense for the 20-round magazine in the weapon. A spare magazine with SS109 could still be available if facing a vehicular-borne threat. SAINT comes with well-designed carrying case that allows pistol to be carried with a 20-round magazine in place. It has pouches on its exterior for additional 30-round magazines. However, firing lots of rifle-caliber rounds with penetrating bullets in an urban area can be disastrous. Training in shot placement is important as well. Your bullets should go where you intend them to go. The more I use the SAINT and the Rattler, the more I like them. This column isn’t intended as the final word on using rifle-caliber pistols as vehicle weapons. It’s more just offering the thoughts and ideas that have occurred to me as I’ve trained with these weapons over the last few months. I’m still in the learning curve.